Working outside during winter can be a chilling experience. For workers, cold weather can be a serious hazard. Construction, trucking, farming and logging are examples of occupations where the potential for hypothermia and frostbite exists. There are also safety problems associated with working in cold environments – ice, snow, burns from contact with cold metal, slowed reaction time and snow blindness. You are properly clothed for the outdoors if you can work comfortably. 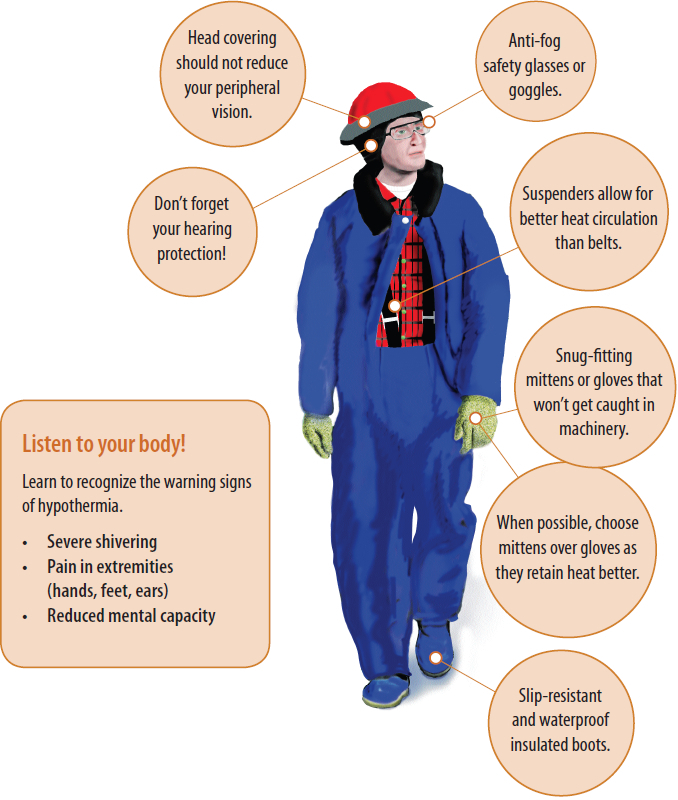 Protecting yourself from the cold should not interfere with the use of your PPE. Your work pace should not cause heavy sweating that will result in wet clothing. Layers of clothing should be removed or added in accordance with your body temperature. A healthy worker who is properly protected and takes reasonable precautions can function efficiently and safely in cold environments.